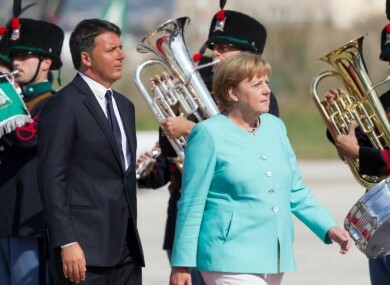 Italian Premier Matteo Renzi and German Chancellor Angela Merkel at Naples' Capodichino international airport today. THE LEADERS OF Italy, France and Germany have insisted that Britain’s shock decision to leave the European Union (EU) will not kill the bloc. Speaking aboard an aircraft carrier anchored off the Italian island of Ventotene, the leaders vowed to strengthen the European project following the Brexit vote. “Many thought the EU was finished after Brexit but that is not how it is,” Italian Prime Minister Matteo Renzi said. Calling out the continent’s Eurosceptics, he said it was “easy to complain and find scapegoats”. The EU “is the answer” to Europe’s problems, for it cemented “peace, prosperity and freedom,” he said. German Chancellor Angela Merkel recalled that the EU had been born from some of the “darkest moments” of European history, a reference to World War II. Echoing Renzi, she said the time had come to “write a better page” in European history. French President Francois Hollande warned that Europe faces a risk of “fragmentation and division”. It needed a “new impulse” on three fronts, Hollande said: the economy; defence and security; and ensuring jobs and education opportunities for young people. The three leaders were speaking ahead of a working dinner aboard an Italian aircraft carrier, the Giuseppi Garibaldi. In a symbolic move, Renzi earlier took his guests to the grave of Altiero Spinelli, a founding father of the ideal of European integration. Renzi called the meeting in a bid to forge a common position on the EU’s future ahead of a summit of the 27 remaining states in Bratislava on 16 September. Europe’s economic outlook, jihadist attacks, the refugee and migrant crisis, the Syrian conflict, and relations with Russia and Turkey are also expected to be covered. The Czech Republic, Hungary, Poland and Slovakia vowed after Britain’s vote to draw up their own plans for a less centralised EU. The Ventotene trip was the start of an intensive tour for Merkel as she attempts to coordinate a response to one of the EU’s biggest crises in decades and quell fears Berlin wants to monopolise the debate. Email “European leaders say the EU doesn't need Britain ”. Feedback on “European leaders say the EU doesn't need Britain ”.